看免费生物讲座 Watch the Video of FREE biology-prep seminar: How to navigate biology classes, competitions, and exams to best achieve your goals on Feb. 11 2017. SpringLight Education was accredited by ACS WASC ( Accrediting Commission for Schools Western Association of Schools and Colleges). We offer high quality education services for you. Are you ready for the AP Biology exam on May 5th? By reviewing essential concepts, giving you detailed FRQ essay feedback, and providing only the most relevant, up to date multiple-choice practices, our course will prepare you for this tough exam. Many schools teach either too little or too much information for the NEW AP Biology test. Spring Light’s test-prep class reviews only the essential material, thoroughly, with an emphasis on those topics YOU need help with. ALL past students have passed the exam, with most receiving a 4 or a 5 (even 9th graders and self-studiers). We can also offer online live class if you can’t come in person. Are you ready for the August 26th SAT II Biology exam? Honor Biology class is for Students without any biology background, this class will serve as an enriching introduction to the subject. We will cover biochemistry, cell and molecular biology, and physiology to form a strong foundation for future leaning (be it eh science bowl, Science Olympiad, or AP biology). Students will conduct experiments with plants, enzymes, microscopes… even an optional pig dissection day at the end of the semester. Mrs. Webster, SpringLight’s current USABO, AP biology teacher. 15 years tutoring and teaching experience. MS in Basic Medical Science (with a focus in Neuroscience), University of Alabama at Birmingham. Computer programming is rapidly increasing in popularity and importance, and has a wide variety of practical applications. Learning such an important skill will exponentially expand your employment opportunities as well as provide an impressive addition to your college applications. SpringLight Education Institute provides a variety of computer programming courses, covering the most popular languages from a beginner’s level to a competition level. SpringLight Education has been professionally teaching Java programming for 4 years and has had exceptional reception among the community. Our class covers the content found in a first year introductory course to Java programming, and requires no prior experience. Our AP Computer Science class has achieved excellent results – 80% of our students received a score of 5. SpringLight has also been providing USACO preparation classes for 4 years with amazing results. Many of our students have received awards at the Silver, Gold, Platinum, and Finalist levels. As long as students can understand the condensed content and do the homework, they will quickly be on their way to the upper levels. SpringLight Education Institute is accredited by Western Association of Schools and Colleges. Transcripts can be provided if required. C++ programming, Java programming: for students who have learned algebra 1. Jessica Zheng, the instructor for USACO Bronze, has experience with multiple computer programming languages, including C, C++, Java, and more. Since 2013, she has been actively involved in the USA Computing Olympiad, where she reached Platinum level and finished as one of the top 26 finalists of the nation. She also has plenty of teaching experience at SpringLight and is helping various educational nonprofit organizations teach science and computer programming. Li Qin, the instructor for USACO Bronze online. Experienced teacher for SpringLight in JAVA/C++ programming and USACO Bronze/Silver/Gold. Top programming contest winner when he was in high school in China. Peter Tang, the instructor for Java programming and APCS. Computer Science Minor from the University of Chicago and a software engineer. He graduated from Lynbrook High School and scored 5 on the AP Computer Science A test. Peter is known as one of the best teachers at SpringLight. Peter’s teaching reflects his clear understanding of his students as well as Computer Science. He has a seven-year teaching experience of tutoring groups and individuals. The summer physics classes are very successful. 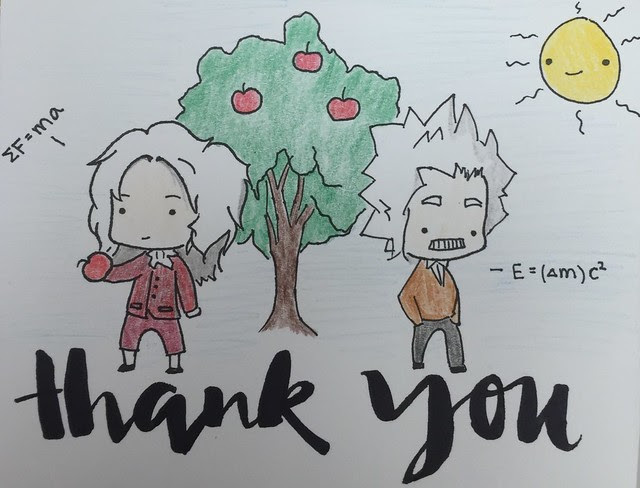 All of the student enjoyed all of their physics classes. If you want to register a class and want to watch a sample physics class that the two teachers taught before, I can send you a video. 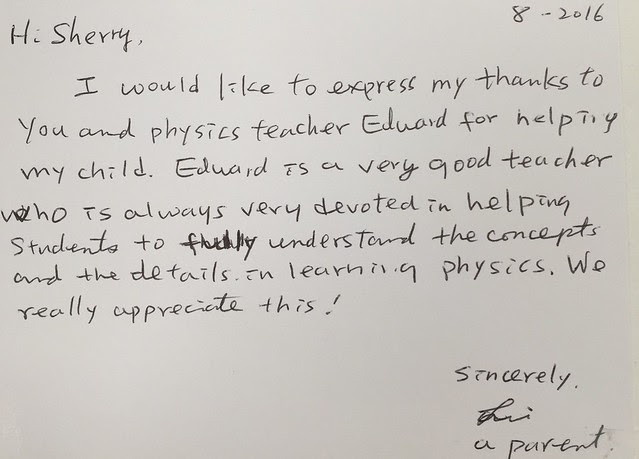 All of this Fall’s physics classes will be taught by two instructors, Dr. Chunlai Yang and Mr. Eduard F. Both of them have very strong profile (details below). Dr. Yang will teach the class online, and Eduard will teach the classes onsite at SpringLight. If you take the class online, we will email you the online class instruction after you register. Private lesson by request $80/hr $750/10 hours. Dr. Chunlai Yang graduated from Peking University (B.S. and M.S. in physics) and Boston College (Ph.D. in Physics). He has taught in the Physics departments of Peking University and Boston College. 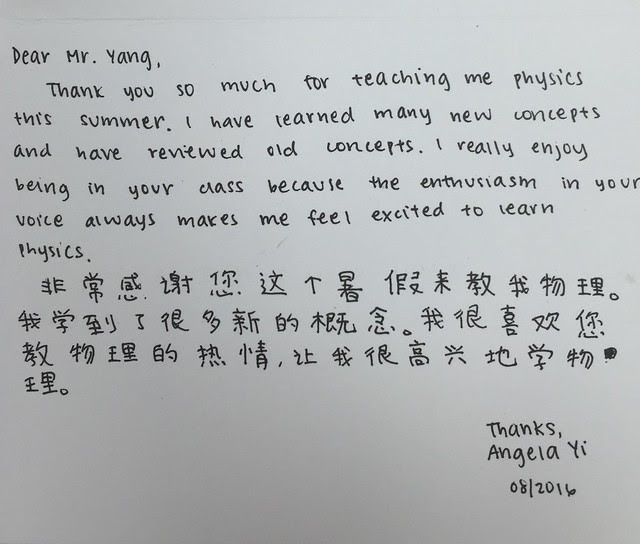 When Dr. Yang taught physics at Peking University, he received the ”Excellent Young Teacher Award”. While working at Boston College, Dr. Yang received the “Teaching Excellence Award”, and also co-authored the textbook: << INTRODUCTORY PHYSICS LABORATORY MANUAL >> by George Goldsmith and Chunlai Yang. In recent years, Dr. Yang has devoted himself full time to tutoring high school students. He teaches many kinds of math and physics competition training classes, and also instructs students in various math and physics courses. His teaching is lucid: concepts are clearly identified and easily understood, with strong logicality. Many of Dr. Yang’s students have made distinguished performances in math and physics competitions, and have achieved excellence in their school courses, which has effectively promoted the opportunities for these students to be admitted into top universities. His own child was accepted into the U.S. Olympiad Physics Team, was admitted to Harvard, Princeton and other top universities, has graduated from Harvard University and is now continuing at Stanford Medical School. Eduard F. has M.S. degree in Mathematical Physics from Physics department of the St.Petersburg State University in Russia. When he was in high school, he participated in a number of Soviet Math and Physics Olympiads at the regional and national levels. He was a member of the Soviet and Russian National Teams in the 1980-90s at many international competitions. Most of his USAPhO students qualified as semifinalists. This year seven of his eight private and group students qualified for the semifinal competition. 2016 Fall AP biology and USABO classes will start soon! Mrs. Webster will give two biology classes: USABO, AP Biology this fall. She is one of the most popular teachers at SpringLight. Read the students’ review for her below. Watch her sample class video at https://youtu.be/qUoAU59Losg. Register the biology classes at https://goo.gl/F7uO7p. We offer one trial class, and if you are not satisfied after one class, you may cancel and are not required to pay tuition for that class. Meeting every weekend throughout the fall semester, this class will cover the entire AP Biology course as laid out by the College Board. Students will gain a complete, in-depth understanding of all required AP Biology concepts, as well as plenty of practice and feedback. All past students have scored well on their exams, even 9th graders and self-studiers. This class is for highly motivated USABO competition students (including the USABO students who started over the summer). As recommended by the USABO organization, we will be covering every single chapter in the Campbellbiology book (the official book of the competition). This means students may need to read and review up to 5 chapters a week. NEW HOT TOPIC! Add NACLO on your application! Take our class to prepare for next year’s contest! Computational Linguistics plays a more and more important role in modern technology. It also weighs more in college admission no matter if you want to study computer science or linguistics. The North American Computational Linguistics Olympiad (NACLO) is a contest in which high-school students solve linguistic puzzles. By solving these puzzles, students learn about the diversity and consistency of language, while exercising logic skills. No prior knowledge of linguistics or second languages is necessary: even the hardest problems require only your logical ability, patient work, and willingness to think outside the box. The number of students who participate in NACLO every year from the U.S. and Canada is less than 2000, which leaves a strong chance for students to enter the semi-final round. NACLO is as important as USAMO, USACO, USABO, USAPhO and USNCO, although it is still not widely known by the students and parents. SpringLight Education Institute is accredited by Western Association of Schools and Colleges. A transcript can be provided if required. Nelson Niu is NACLO Finalist [top 4 in the nation, red team in the US team]. He won an individual silver medal and was a US team gold medalist in ILO this summer. He also was accepted into MOSP and MIT Prime, and has been an experienced teacher and tutor in SpringLight for many years. Come to take our class and prepare for the NACLO! Register today! Dr. Yang is going to teach online physcis classes in the fall, continuing the success of his spring and summer classes! Our online classes are taught in real time, so that students can ask questions and talk with the teacher during the class. There will also be homework, quizes, and tests which will be reviewed by the teacher with comments and grades. We also record every class and keep them online for students to review. Among the students who took his online class in the spring, more than 80% got a 5 on the AP Physics 1 test. All the students got a 5 on the AP Physics 2 and AP Physics C. Hurry up and register today! SpringLight Education Institute is accredited by Western Association of Schools and Colleges. Transcript could be provided if required. ​Meeting twice a week throughout the summer, this class will preview the entire AP Biology course as laid out by the College Board, with a special emphasis on the most challenging chapters (photosynthesis, cell signaling, etc). All past students have received a 4 or a 5 on their exams, even 9th graders and self-studiers. Are you ready for the October 1st SAT II Biology exam? This class will help you prepare by reviewing every single subject necessary for the exam according to the College Board. We will use practice questions from multiple sources and complete >5 practice exams before test date. This class is for first-time USABO competition students who are highly motivated. Instructor Mrs. Webster: With over 10 years of tutoring and editing experience, Mrs. Webster teaches biology, test prep, and writing(including application writing). Funny, articulate, and knowledgeable, she is often called “the best teacher” by her students. 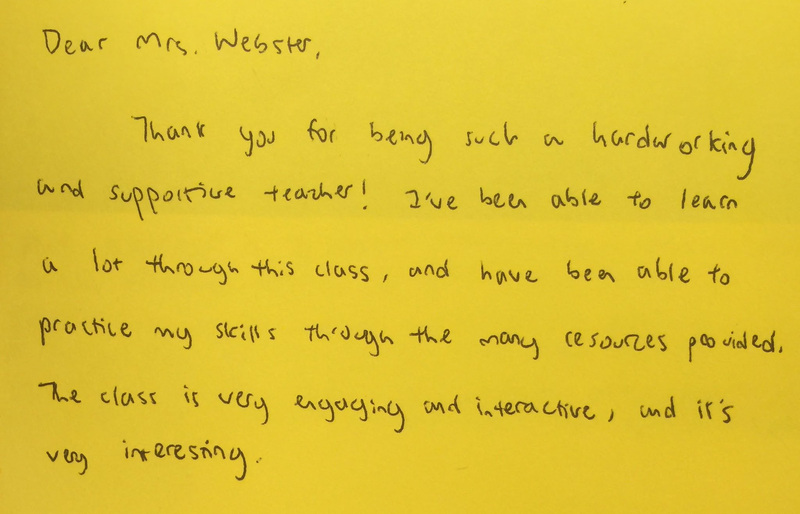 Mrs. Webster’s students have been very successful indeed: her application-writing students have been accepted to Ivy League schools; her USABO students have made it to nationals; her ACT students have achieved dramatic, 10 point increases in their scores—and sometimes even perfect scores. Raised by Jewish tiger parents, Mrs. Webster was a National Merit Scholar, receiving 1560/1600 on her SATs and 5’s on her APs. Funded by a 30 thousand dollar writing scholarship, she earned a BS in biology with a minor in studio art from Lake Forest College, IL. She then studied neuroscience at UAB and received an MS in biomedical science. Is your student ready for the AP Biology test? There is a lot of material covered by the exam–now is the time to begin reviewing! Our class supports students with an organized review structure.An excellent HS teacher may be sufficient to help your child prepare, but many HS teachers neglect to consult the College Board website, teaching students either too little or too much information for the AP test. Therefore, SpringLight’s test-prep class reviews only the essential materials, but reviews them thoroughly.Many students feel that they need more practice for the Free Response section of the test (which is 50% of the overall score!). Therefore, SpringLight’s test-prep class assigns weekly Free Response questions andprovides each student with detailed, individual feedback. SpringLight has very strong experienced biology teachers! SAT biology students got score 720(from 600) to 800.